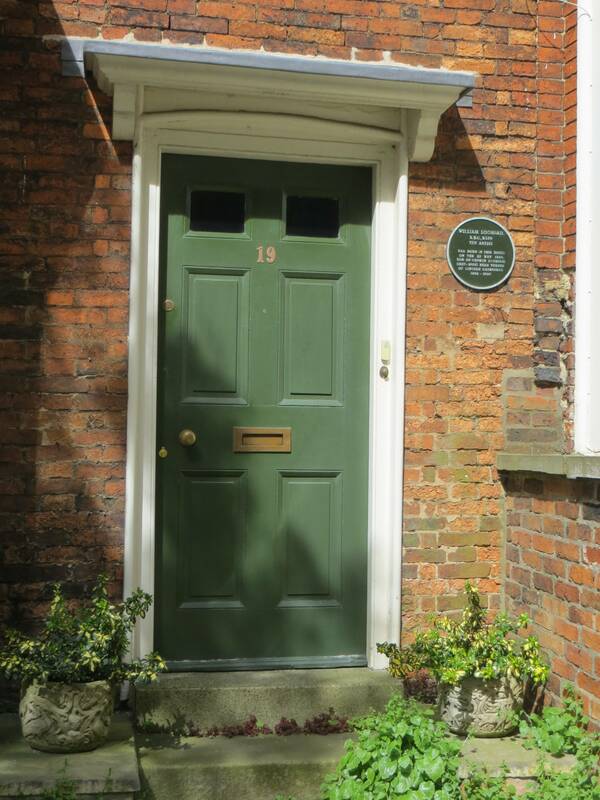 Lincoln is rich in history, one of Britain’s most important medieval cities, but often overlooked today. 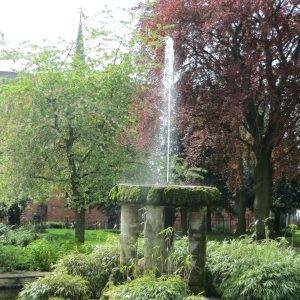 This walk takes you through every era from Roman to the modern day, with the glorious cathedral as its high point. 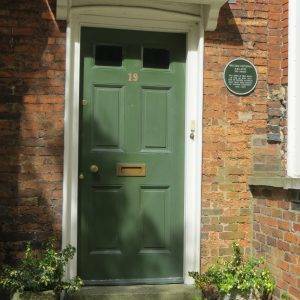 Number of listed buildings: 418, of which 43 are Grade I and 39 are Grade II*. the cathedral is one of the most noted architectural structures in the UK, notable for its scale, beauty and antiquity. 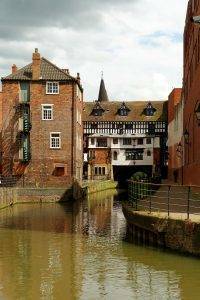 Lincoln is situated in a gap in the Lincoln Cliff, a major escarpment through which The River Witham flows. 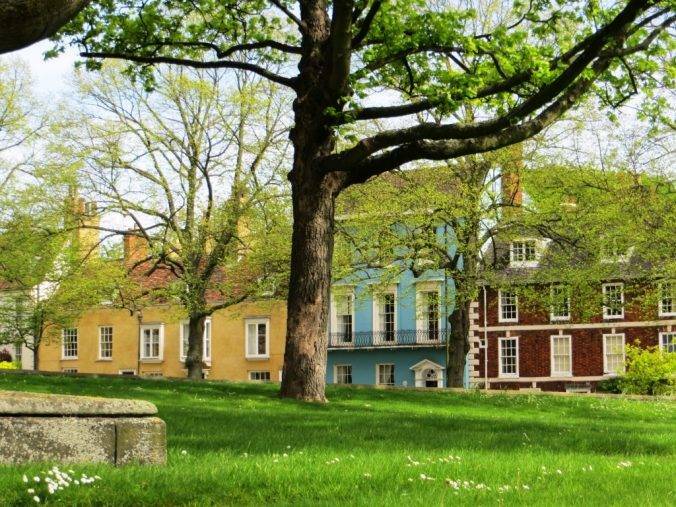 Lincoln is thus divided into two zones, known locally as ‘uphill’ and ‘downhill’. The uphill area is the historical quarter, including Lincoln Cathedral, Lincoln Castle and the Medieval Bishop’s Palace. It also has residential suburbs to the north and northeast. The downhill area comprises the city centre and the suburbs to the south and south-west. The accurately named street ‘Steep Hill’ connects the two. 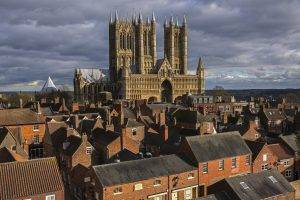 This divide gives Lincoln its distinctive character, and makes it feel very different from other cities, in which the chief historical buildings (cathedrals and castles) tend to be centrally located and intermingled with the present-day city centre. 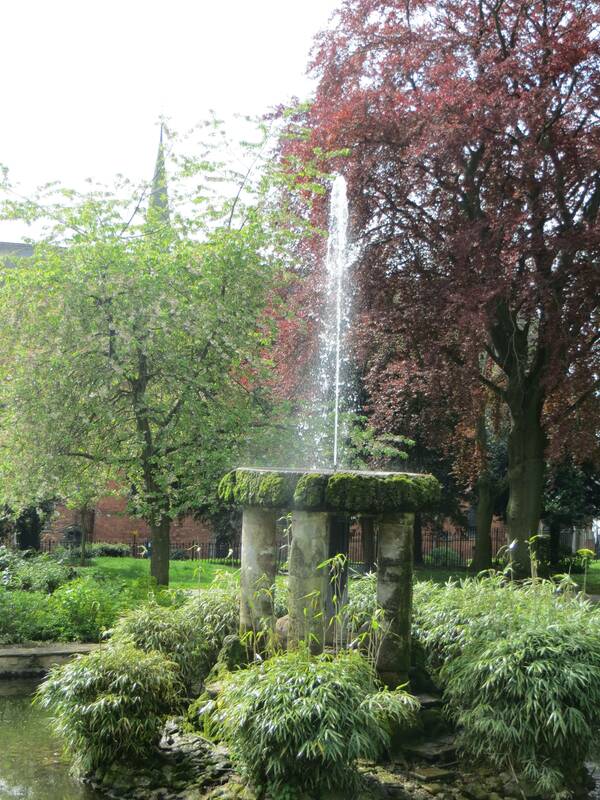 It is not difficult to understand why the Romans were attracted to Lincoln. 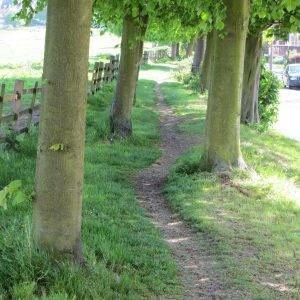 The gap through the Lincoln Cliff offered a natural east west route-way either by water or on foot. Roman engineers also saw the possibility of linking the River Witham to the River Trent by building a canal. That canal, the Foss Dyke, is remarkably still in use today; and through the ages, the links to Yorkshire and the Midlands via the Foss Dyke have brought trade and prosperity to the city. Even after the Romans abandoned Britain in the early 5th century, the importance of the port remained and William the Conqueror saw it as an important strategic outpost to his kingdom. The great and prosperous medieval city of Lincoln was built on the wealth (mostly in wool) that traded up and down the River Witham. It was one of the most important cities in the country. But as Britain industrialised, so Lincoln became something of a backwater, separated from the great routes north (the A1 and the East Coast rail line, which both pass to its west). Today it is perhaps one of the least visited cities and county capitals. 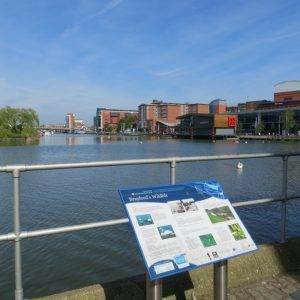 Brayford Pool is a natural lake formed from a widening of the River Witham. It was used as a port by the Romans, and has a long industrial heritage. The Pool has been the focus of Lincoln’s urban regeneration since the early 1990s. Although this has helped bring this area of the city back to life, it is occupied by a dispiriting array of chain bars and restaurants, none of which seems to be markedly thriving. 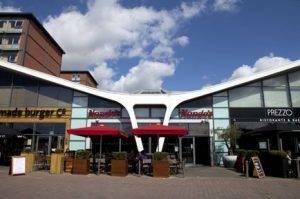 There is one interesting structure amidst the mediocrity; now housing the Handmade Burger Co., Nando’s and Prezzo, the original building was designed in 1959 as a sleek car showroom, featuring a reinforced concrete hyperbolic paraboloid shell roof (that’s a mouthful). Its petrol pumps originally faced Brayford Pool. A Grade II listing in 2000 saved it from all the re-development around. 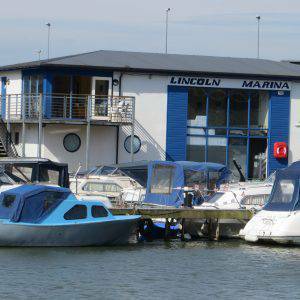 The south side of Brayford Pool is now home to the thriving University of Lincoln. It has grown to 10,000 students in little over a decade and has made a marked difference to the city, adding a youthful buzz to it. The architecture is striking too, with several good new buildings (notably the Isaac Newton Building, the School of Architecture and much of the student accommodation) and conversion of old railway structures (the Engine Shed, which you passed if you started at the station). The Foss Dyke, which runs into Brayford Pool, connects the River Trent at Torksey to the River Witham. It is believed to be the oldest canal in England still in use. Built around 120 AD by the Romans, it was renovated in 1121, during the reign of King Henry I. Improvements made in 1671 included a navigable lock at Torksey, and warehousing and wharves were built at Brayford Pool. Next, we cut up to the expanse of West Common (100 hectares, 297 acres), which has been an open space since Roman times when it was used as an area of agricultural production for the military. A race track was built there in 1773, but closed in 1964. The grandstand, the stables and the numbers board still survive, giving added character to this delightful green space, kept now as meadowland. During The First World War, the Common was used to test aircraft assembled in the city’s many industrial plants. The airfield had turf runways and a number of outbuildings, several of which are still evident as earthworks. Directly south of the grandstand there is an earthwork marking the location of a former training trench. Ellis’s Windmill merits the minor detour involved, all of 50 metres. 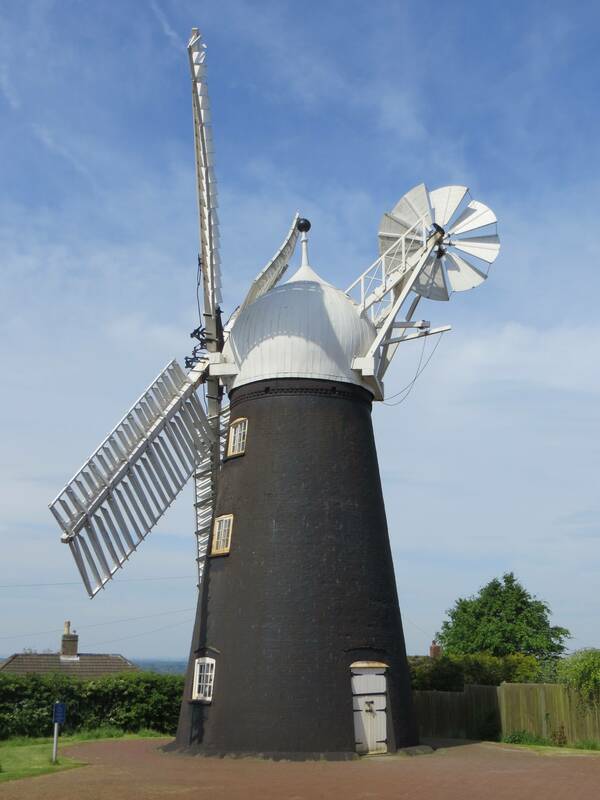 Placed on the top of the hill to get the most wind, this evocative mill is located on Mill Road, so called due to the nine windmills that formerly faced west over the steep slopes of the Lincoln Edge. 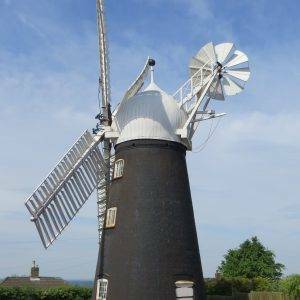 Ellis Mill is now the sole survivor of these mills and an excellent example of a small tower mill. The mill you see dates from 1798 but there had been a mill on this site from at least the middle of the 17th century; the mill was working until the 1940s and was more recently restored. Before you take a look at the castle, it’s worth popping into The Lawn (1820), a notable Greek revival building which began its life as a lunatic asylum, where you will find the Joseph Banks Conservatory, a tropical house themed with plants reminiscent of voyages the botanist took with Captain James Cook. 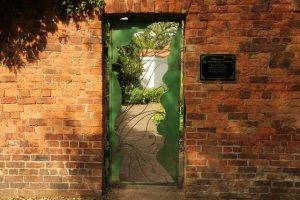 Past the conservatory is the very tranquil walled John Dawber Garden. 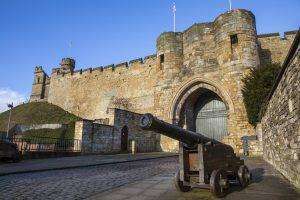 Lincoln Castle was constructed during the late 11th century by William the Conqueror on the site of a pre-existing Roman fortress. The castle is unusual in that it has two moats, one of only two in the country. It is still possible to walk around the immense Norman walls which provide a magnificent view of the castle complex, together with panoramic views of the cathedral, the city and the surrounding countryside. Another major reason to visit the castle is the opportunity to see one of the four surviving originals of the Magna Carta, sealed by King John in 1215. There is also an accompanying exhibition, explaining the origin of the Magna Carta and its far-reaching effects. The Bishop of Lincoln, Hugh of Wells, had been one of the signatories to the Magna Carta and conseqently it was kept for hundreds of years at the cathedral before being transferred to the castle. Lincoln Cathedral is nearly a thousand years old and was reputedly the tallest building in the world for more than two centuries (1311–1549). John Ruskin, never one to be shy in his opinions, declared: “I have always held that the cathedral of Lincoln is out and out the most precious piece of architecture in the British Isles and roughly speaking worth any two other cathedrals we have.” Pevsner was also effusive, especially about its setting: “Apart from Durham, there is no English Cathedral so spectacularly placed”. Standing in the shadow of Lincoln Cathedral, with sweeping views over the ancient city and the countryside beyond, the medieval Bishops’ Palace (late 12 century, with 15th century alterations), just to the south of the cathedral, was once among the most important buildings in the country, being the administrative centre of the largest diocese in medieval England, stretching from the Humber to the Thames; and its architecture reflected enormous power and wealth. The only bit surviving today is the undercrofted West Hall, which is an English Heritage site. 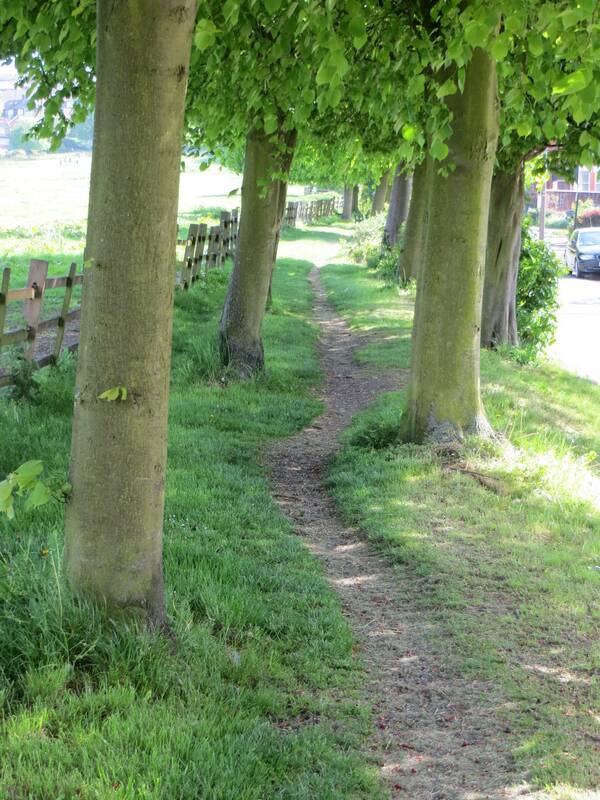 The Lincoln Arboretum (9 hectares, 22 acres), a park to the east of the cathedral, was designed and laid out between 1870 and 1872 by the well-known Victorian gardener Edward Milner, following the national trend for providing public parks for workers to relax in and enjoy the fresh air. 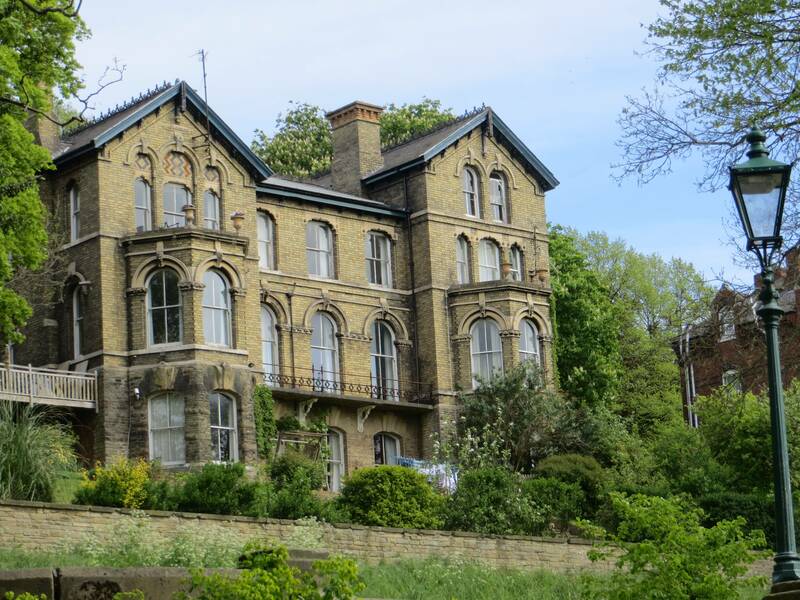 Part of the deal was also to sell 1.2 hectares (3 acres) of the land for residential building purposes to help fund the layout and construction of the Arboretum; these large Victorian houses can be seen on the northern side of the park. 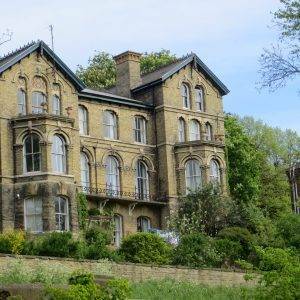 This practice of property speculation around the added amenity that a park view offered was a very common way of funding the many Victorian parks that sprung up across the country during this period. 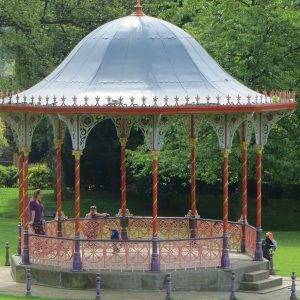 A bandstand was added in 1884, and during the 1890s the arboretum became a very popular music spot, frequently attracting over 40,000 people to concerts. 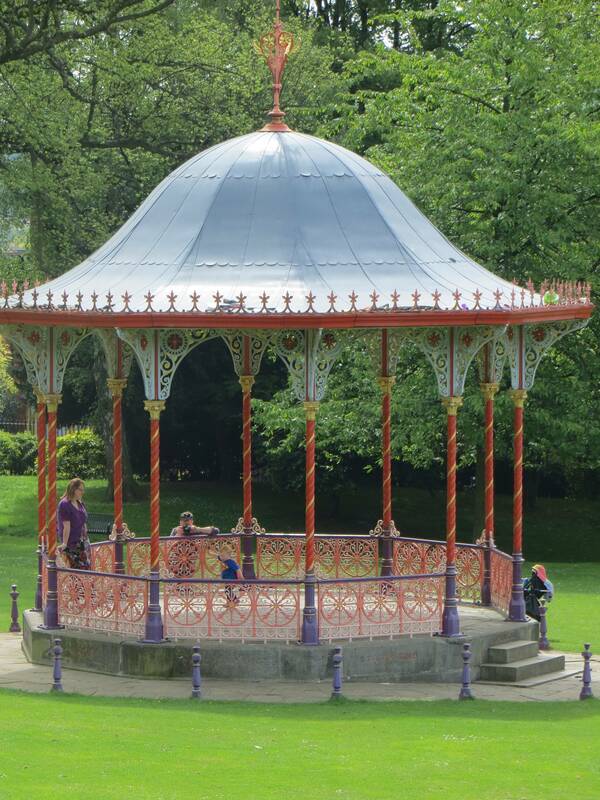 After being badly neglected in the second half of the twentieth century, a major restoration project was undertaken just after the turn of the millennium, and the park you see today gives enormous pleasure, with its beautiful gardens, lakes and bridges, children’s maze, two fountain features, Victorian bandstand and tea room/café. 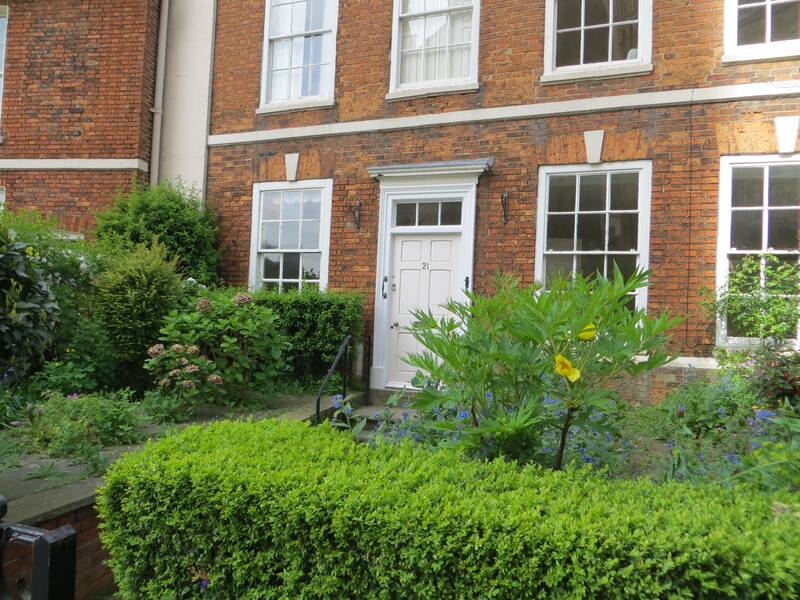 The walk ends up passing through terraced streets of small artisan houses to reach the River Witham. 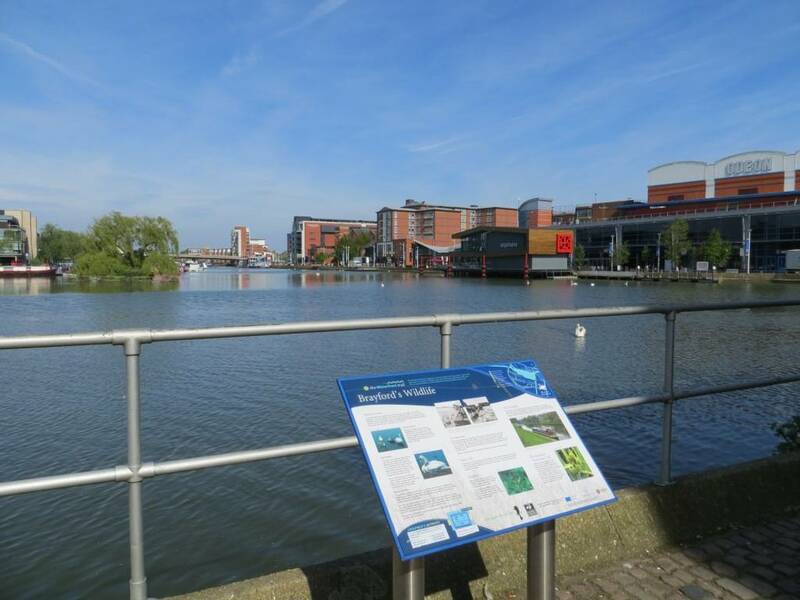 Looking across to the south bank, you will see the site of the famous Lincoln engineering company, Ruston & Hornsby, which was a major producer of diesel engines and heavy duty gas turbines. In the 1960s it was Europe’s leading supplier of land-based gas turbines. 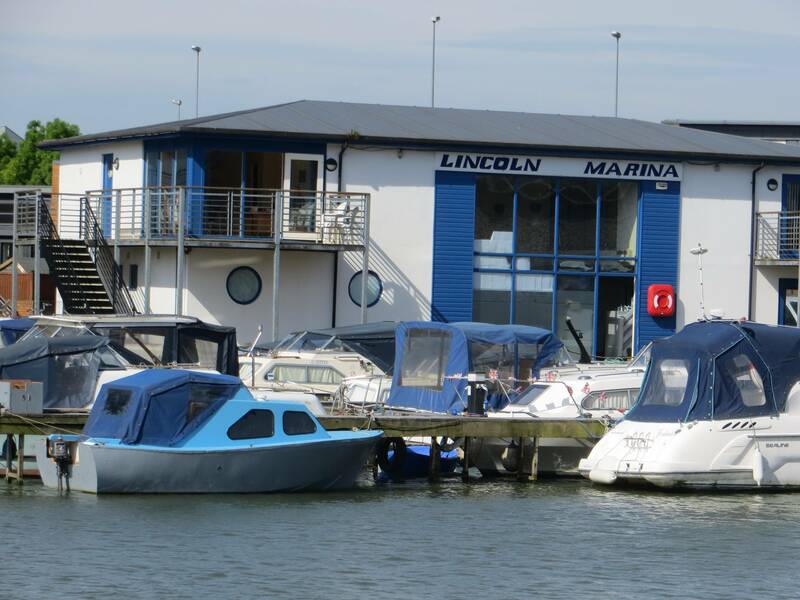 It is a good example of Lincoln’s strong engineering heritage, much of which sadly was swept away in the de-industrialisation of the 1980s. Happily, this plant still survives, now under the ownership of Siemens. 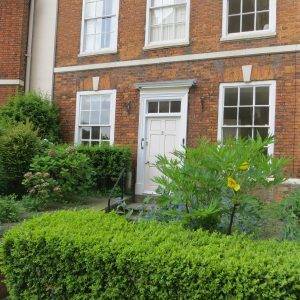 As our route nears its finish point we crossed the High Street at the 16th Century House on High Bridge. This is one of only three bridges in England with shops on them, the others being Pulteney Bridge in Bath (which we cross in the Bath chapter) and Frome Bridge in Somerset – of which this is easily the oldest. The bridge itself is thought to date back to the 12th century, making it possibly the oldest standing bridge in the country. Lincoln is full of history and medieval buildings, and is probably the most unchanged city of any I have walked through; still dominated by its historic quarter and never really having had a massive population spurt in its history, nor having been significantly damaged by the Luftwaffe in The Second World War, nor having attracted new town status. And the council is to be applauded too, in its future plans for the city, encapsulated in the Linking Lincoln Masterplan, first devised in 2005, which has as one of its primary aims to “re-stitch the city centre to its wider context” – basically, favouring the pedestrian over the car. Hurrah. Take the (unpleasant) footbridge over Melville St and then continue W, crossing a canal-type bridge and then climbing up some steps to the High St; cross immediately over and descend through the ‘Glory Hole’ back to the river; you will shortly arrive at the bridge where you began. Brayford Pool has many chains to choose from, but the more characterful eateries and cafés are to be found in Bailgate, close to the cathedral. The Ice Cream Parlour, 3 Bailgate, LN1 3AE (Tel: 01522 511447, www.gallonesicecream.com) is recommended, for, amongst other things, ‘its weird and wonderful flavours’. There is also a quaint café set in the cloisters of the Cathedral called the Refectory, serving local produce. 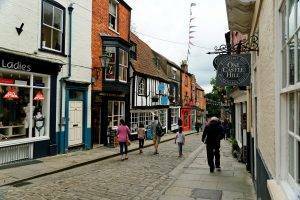 Steep Hill & The Strait provide a great selection of food and drink, exclusive and vintage clothing, old bookstores and other speciality shops. Bailgate, by the cathedral, is another place for interesting independents. 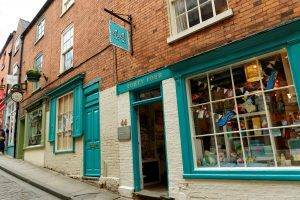 Wander around the cobbled streets and you will find many shops to interest, gifts, food and fashion. Lincoln Castle, Castle Hill, Lincoln LN1 3AA (Tel: 01522 782040, www.lincolncastle.com) offers lots of history, great views and of course the chance to see an original copy of The Magna Carta. The Collection, 1 Danes Terrace, LN2 1LP (Tel: 01522 550990 www.thecollectionmuseum.com) brings together an award-winning archaeology museum and the region’s premier art gallery, the Usher Gallery. Lincoln Cathedral Take a look around one of Europe’s finest Gothic buildings.